There are lots of tools out there to check your credit score and report. I’ve used a lot of them, both free and paid and have finally found my favorite: MyFico.com. Let me tell you why. As you can see in the image above, myfico has a lot of options to get your credit. You can order your score and report from all three bureaus (Experian, TransUnion, or Equifax) for $60 or you can order it from just one of the bureaus for $20. I do find it a bit odd there’s literally no discount for ordering more than 1, but I digress. You can also choose to get credit monitoring from either one bureau or all three bureaus. The final one is Identity Ultimate for those of you with more paranoia and money than sense. Most of these are a pretty big rip-off. Sixty dollars to view all three of my reports? If I could afford to throw away $60 just to see three reports, I am probably in a place where I don’t need to worry about my credit report. But one of these options shines above the rest: the 3-Bureau Credit Monitoring. 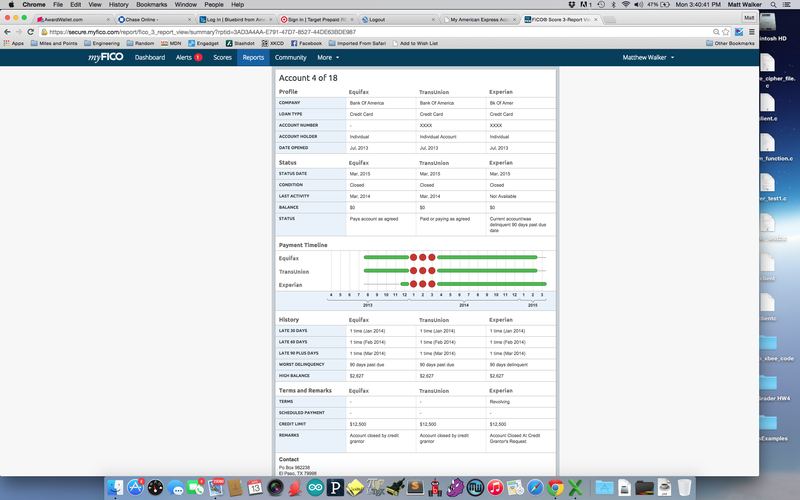 I don’t really care about the monitoring, but this comes with a free score and report from each of the bureaus. It’s the same as the sixty dollar option at less than half the cost. The catch here is that you have to remember to cancel before you get billed for the second month. 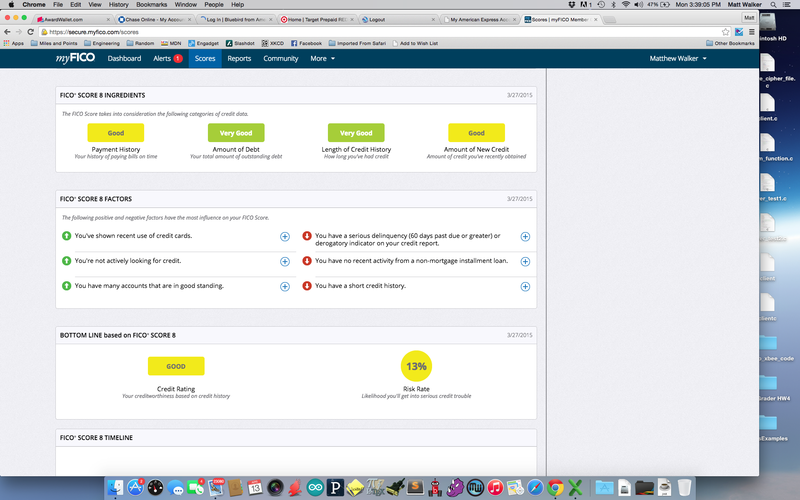 Now that we know which option to choose, lets dive into the service. Whenever you sign in, you’ll see your Dashboard. I’ve included a copy of mine below. Before I get any snotty comments – I know my score isn’t very high. It used to be great but I went through some stuff and I’m working on it, so just give me a break. On the dashboard we see all the important stuff. 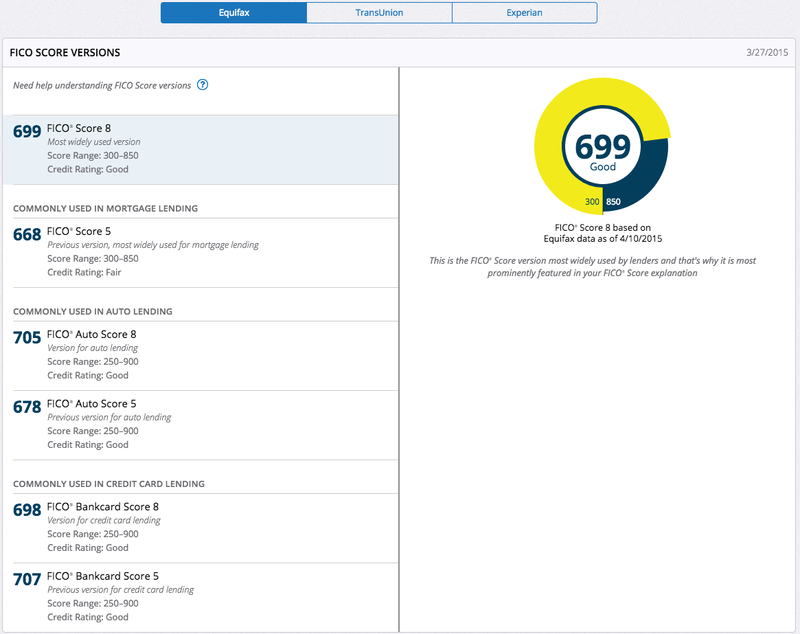 Your score from each bureau which gets updated each time myFico receives an update from that bureau. Mine happened on about a weekly basis.It also shows the score timeline and any alerts. Mostly I just found the alerts annoying since most of them are for dumb things like paying a bill. But you can set preferences for what triggers an alert. 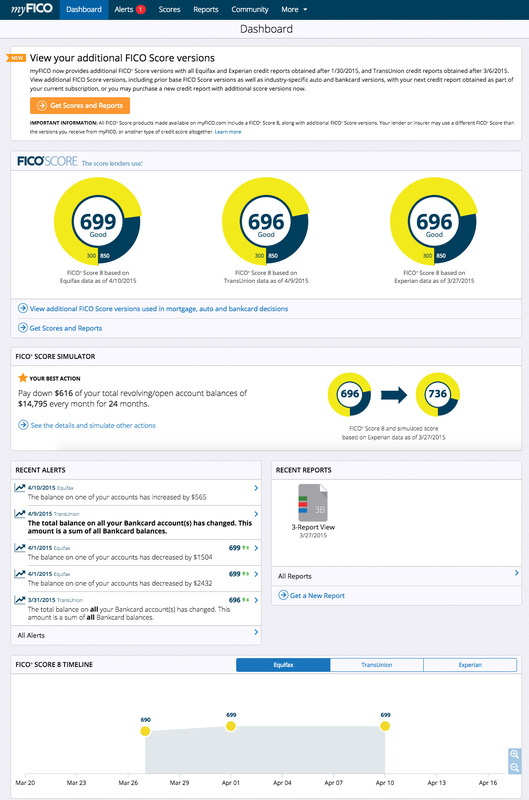 The most powerful thing about myFico for me is that you get actual scores. Most free services like CreditKarma only give you an estimated score and mine has often been off by over 30 points when compared to the actual score. 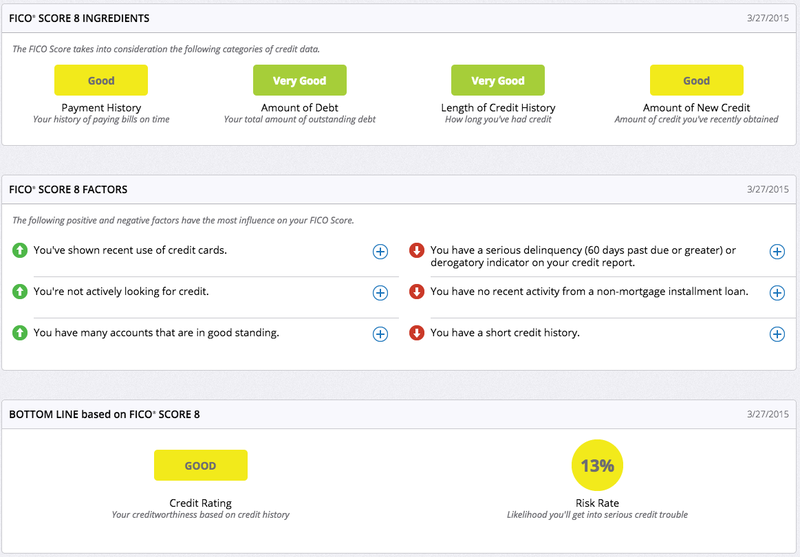 Even most paid services that give you your report don’t give you the actual credit score. And myFico doesn’t just give you one score, it gives you half a dozen different kinds. It gives you the Fico Score 8, Fico Score 5, Fico Auto 8, Fico Auto 5, Fico Bankcard 8, Fico Bankcard 5. 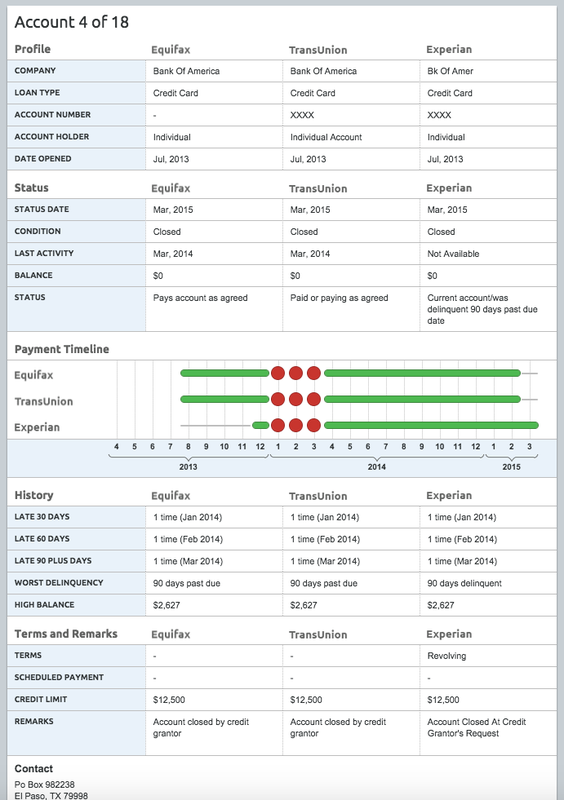 I found this to be the most interesting part and the feature that sets myFico above the rest. For each type of score, it give you the breakdown on the positives and the negatives and rates how you are doing in four different categories. In addition to viewing your scores, you can look at the report that came when you signed up. I’ve uploaded a screenshot of mine below to get you a sense of what is included. Again, don’t give me crap for missing a few payments. Trust me, I beat myself up about it often enough without you chiming in. This report is full of all kinds of good data including: opening date, high balance, credit limit, and payment history. These are all the most important things when determining your score. The final thing I want to talk about is the score simulator. Lots of sites have these but this one is the best I’ve seen. (Credit Karma kept saying I would lower my score by paying on time). You can put in hypothetical situations and see how it affects your score. I played around with it a little lot and figured out that my big problem is not the current amount of debt but the late payments in the past. So this tells me that there is really very little I can do to affect my score other than continue to pay on time and wait it out. In conclusion, myFico is the best service I’ve found to tell you your credit score. It gives your actual credit score in six different variations from each of the three credit bureaus. It has great data from your report and a great way to visualize it. It can be expensive for the three reports but if you sign up for the 3-Bureau Monitoring Service and cancel immediately, you’ll get all the benefits at half the cost. 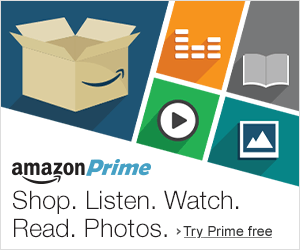 Posted on May 9, 2015 December 11, 2015 by mwwalkPosted in ReviewTagged Credit Cards, Credit Monitoring, Credit Report, Credit Score, Equifax, Experian, myFico, Review, TransUnion.